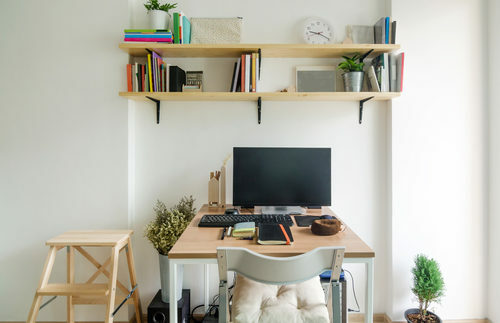 With more and more people telecommuting, both full- and part-time, home office spaces are becoming increasingly popular. 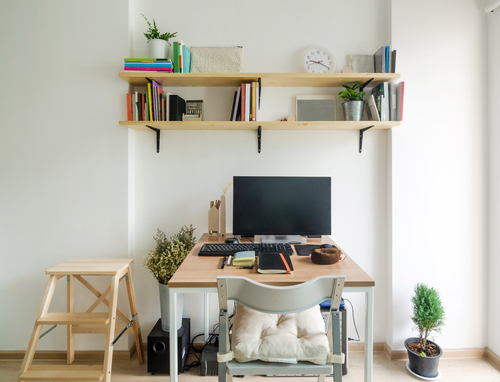 Whether your house has a designated office, a spare bedroom converted to an office, or you’re improvising a nook in your kitchen or hallway, here are some “design for comfort” tips to setting up that perfect work space. • Your chair: One of the most important things about a work space is the chair you’ll sit in – be sure to get something that is ergonomically correct for your body type. Some people prefer multiple adjustment options, while others are comfortable in a standard seat. You can find good deals on chairs at office supply stores and can test them out in-store before purchase. Also check Amazon or other online retailers for a better price once you’ve decided. • Your desk: It can be as simple as a card table or something custom built, but make sure it has sufficient surface area for your computer and a couple other desk essentials (note pad, pens, etc.). Office supply stores have a large selection, but so do some furniture stores so shop around. Another option is to have a custom work area built-in by a company such as Closet Factory or a private contractor. If you plan to work from home long-term, built-ins can make for more storage space and are very aesthetically appealing. They will also increase the resale value of your home. • Lighting: Try to set up your work area near a window. Natural light helps you feel awake and has been proven to increase productivity and happiness. If that’s not possible, invest in a good, bright desk lamp. Don’t let it shine directly in your eyes, though, as this could harm your vision and interfere with sleep patterns, especially if you’re working in the evening hours. • Ergonomics: Not sitting comfortably while working can lead to back problems, carpal tunnel syndrome, and various other aches and pains. Simply sit up straight with your lower back against the chair, feet resting flat on the floor (get a foot rest if needed). Set your monitor to just over an arm’s length away and slightly higher than eye level. Your forearms should be parallel to the floor when typing. Use a wrist wrest for your mouse and keyboard. Having a comfortable work space is just as important when working from home as it is when working from a company’s office. Give yourself the space and assets you’ll need to be productive and satisfied with your career choices.